This Serger is a Discontinued Model. It is a NEW Serger, in the original box. It comes with all of it's original accessories. 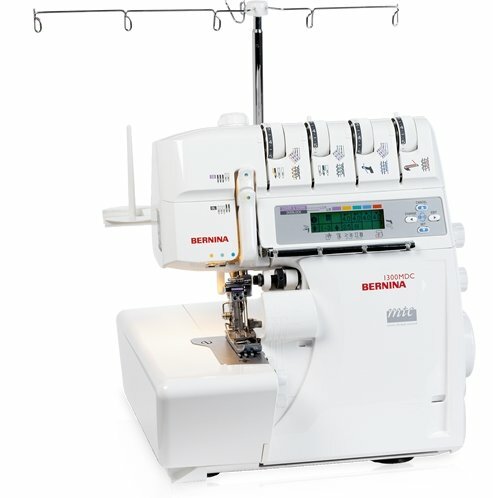 The Bernina 1300MDC is a combined overlocker and coverstitch machine, it is very simple to change from overlock to cover stitch, with the LCD giving on screen instructions. This machine is very simple to thread and with the benefit of the patented Bernina Micro Thread control loose loopy edges are a thing of the past. Set the over-edge thread length at the twist of a knob. The hard-wearing safety seam (combination stitch) is ideal for reliably joining firm woven fabrics, such as jeans. The 3- and 4-thread coverstitch gives you an especially durable, flat stitch in highly elastic fabrics. The BERNINA lay-in system lets you thread quickly and directly - and it's also simple to thread the lower looper, thanks to the automatic lower-looper threading system. Easy, ergonomic operation: With the aid of the vision panel and the red position indicators, you'll find the ideal position of the needles and lower looper for threading straightaway. This Machine is available for purchase online. It is available for pickup in our store or we can ship it to you anywhere in the Continental USA only.